ISLAMABAD: The general headquarters on the recommendations of intelligence agencies has imposed indefinite ban on self-proclaimed strategist/analyst, Zaid Hamid. Known for his anti-India and anti-Israel verbosity, the analyst always claimed to have been closely working with country’s premier intelligence agencies. “I am an analyst running a think-tank. I do research work and many organizations including armed forces utilize my work,” Mr Hamid had claimed in one of the Capital TV’s programs last year. Raised and educated in Karachi, he got prominence by defending a blasphemy accused. Later, he started a series of TV talk shows and repeatedly accused RAW, Mossad and the CIA to destabilize Pakistan. He once asserted that November 2008 Mumbai attacks were a handiwork of “Hindu Zionists,” to justify surgical strikes inside Pakistan. His critics call him a conspiracy theorist. A couple of yeara ago, Imaad Khalid, a former colleague of Mr Hamid, made some startling allegations that Mr Hamid was following a Hizbut Tahrir (HuT) like strategy to orchestrate an internal coup in the army. Mr Hamid always refuted those allegations. The strict directions from the general headquarters read that he could not interact with any military personnel in his individual capacity or as a representative of any think-tank or the organization. Similarly, all concerned military personnel were directed not to invite him in any official ceremony as a guest speaker. They were asked not to interact with him in any other way. Interestingly, Mr Hamid’s father was an ex-army official. Military spokesman refused to comment on the story. An official, requesting not to be named, said the army would never like to be seen as a party against any such individual. “It’s way beyond its dignity,” he added. Military sources said the intelligence agencies had long warned Mr Hamid not to misuse their name at public forums. They did that because Mr Hamid always took pride in telling people how close was he with the top military brass. He even made some people believe that the country’s intelligence agencies were seeking guidance from the research work his organization was doing. Several attempts were made to contact Mr Hamid, but he did not respond. KARACHI: Additional District and Sessions Judge South Abdul Qadoos Memon on Saturday again issued arrest warrant of political commentator Zaid Hamid and also issued orders to DPO Rawalpindi in this regard. The second accused and anchorperson of a private channel Mubashir Lucman has filed petition for exemption from the hearing. During the hearing, counsel of Geo TV demanded the court to issue non-bailable arrest warrant for Zaid Hamid. On it the court said such warrant was issued at that time when the accused refused to receive bailable arrest warrant. It is to be mentioned here that the arrest warrant could not be received at the home of Zaid Hamid due to his absence. Meanwhile, the counsel of Mubashir Lucman filed immunity petition with the court by taking stand that his client was facing security problems and threats and he had to come to appear in the court from Lahore and due to engagements he could not appear in the court. The court adjourned the hearing till May 24. By making Zaid Hamid and Mubashir Lucman as party, the Independent Media Corporation in its petition adopted that in a programme ‘Kharra Sach’ of a private channel (ARY), baseless allegations were levelled against Geo/Jang Group that they were launching campaign against Pakistan by taking money from Indian news channel Doordarshan. Further allegations were also made against Geo in connection with ‘Zara Sochiea’ and ‘Aman Ki Asha’ in which it was said that Geo was carrying out negative campaign. The petitioner also provided CDs of that programme. ISLAMABAD: Role of some rouge elements, who always claimed their attachment with Inter-Services Intelligence (ISI), was completely exposed in Hamid Mir attack episode and subsequent events on Saturday. Continuously threatening Hamid Mir for many days, self-claimed ISI stooge Zaid Hamid stated after Karachi firing on Geo News anchorperson that he desired to get Hamid Mir hanged, and prompted the Pakistan Army to act ‘ruthlessly’ against Geo and Jang Group for “blasphemy”. It is extremely important to mention here that publicly made ‘attachment claims’ of these rouge elements, including Zaid Hamid, were never ever denied by the ISI. 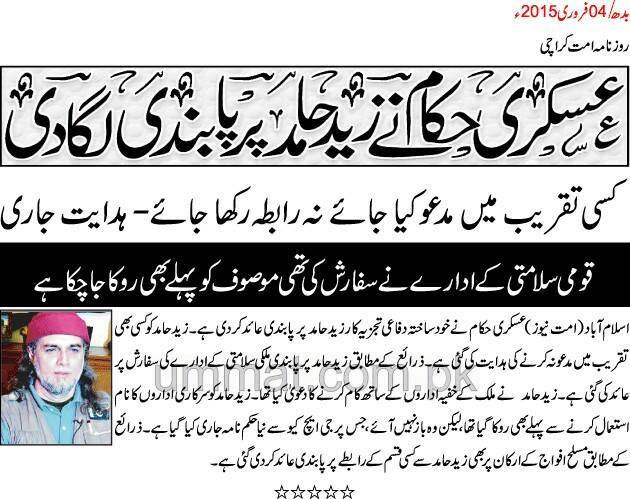 Zaid Hamid has already instituted a treason case against Hamid Mir. Zaid Hamid, while issuing public statements on social media, especially through his known Twitter account, even went to the extent of instigating Chief of Army Staff General Raheel Sharif by naming him and asking him to “fulfill his promise of safeguarding the dignity of the armed forces” by immediately nailing down Geo. He tweeted at 9:54pm “General Raheel, you had promised to protect the dignity of the armed forces at any cost. The time is NOW. Geo must be nailed for Defamation!”. It is very much disturbing for many that Zaid Hamid is still untouched by law enforcement agencies despite the fact that a recent standoff between the Pakistan Army and the civilian government was also created because of statements of Zaid Hamid, but no one has arrested him till date. Zaid Hamid had released and spread on social media an old speech of Defence Minister Khawaja Muhammad Asif by editing it in a criminal way. Some out-of-context sentences of this speech created panic and misunderstanding among the federal government and defence institutions and the interior minister acknowledged some misunderstandings between the army and the government. Khawaja’s speech was based on reasoning and facts and is considered as one of the all-times historic speech by a parliamentarian on floor of National Assembly made during period of dictatorship. Zaid Hamid again openly committed blasphemy on Saturday by terming criticism on an institution as ‘blasphemy’. There are several allegations of committing blasphemy against Sahaba-e-kraam (RA) of Holy Prophet (PBUH) against him, but law never takes its course. On Saturday, after life attempt on Hamid Mir, self-styled stooge of ISI Zaid Hamid condemned the attack, saying that he wanted to see Hamid Mir hanged as the result of conclusion of process of law in the treason case he has instituted against him. Zaid Hamid even wrote, “#HamidMir ISPR must respond ruthlessly to this blasphemy by Geo. How can a TV channel openly abuse/ accuse/ insult ISI w/o proof?” He related criticism or a simple news about an institution to blasphemy of holy and sacred personalities or heavenly books. While Zaid Hmaid wrote that Geo aired news without proof, in fact, Geo aired that according to video and written statement of Hamid Mir given many days before, he alleged that some ISI officers and DG ISI would be responsible if he is attacked. Zaid Hamid own statements, made right after attack on Hamid Mir, proved that written and video statements of Hamid Mir, regarding who would attack him to kill him, were true. Zaid Hamid lives in Cantt area and his location is not hidden. His addresses are House No-683, Street No-4, Chaklala Scheme-3, Rawalpindi, Office: House No-686, Askari Road, Askari V, Chaklala Scheme-3, Rawalpindi, Phone Office: 051-5598046-47. But no one from any government takes action against him. In a move that is a clear case of treason, Zaid Hamid issued a statement on Twitter right after Saturday’s prestigious Kakul passing out parade and wrote, “Khawaja Asif gate crashed PMA Kakul passing out parade today. He was NOT invited 🙂 All army officers ignored him but he remained shameless!” This was a clear attempt against the State of Pakistan, an attempt to bring the federal government and army face to face so that there could be a clash. However, no one has touched Zaid Hamid. Through their Twitter accounts and other means, Zaid Hamid and some retired officers of the Pakistan Army tried their best to fuel the situation on Khawaja Asif issue, which brought institutions at loggerheads but law enforcement agencies are mysteriously silent waiting for very very big happening. It is important to mention that similar attitude and negligence by institutions has resulted into breaking of Pakistan on December 16, 1971.